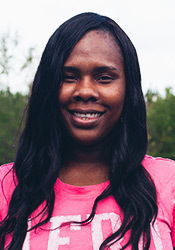 Originally from Whiteville, NC, Alicia graduated from Southeastern Community College with a degree in Early Childhood Education, which she's put to good use raising her four children. As one of our Production Associates, she serves as an integral part of our blending house team: moving, handling, tinning, and just generally making sure your favorite tobaccos are blended with "Love". When Alisha's not at work, you can find her curled up in a chair enjoying a good book or simply spending quality time with her family.